How in the world does having less mean having more? Things are going to be different for many families this Christmas. 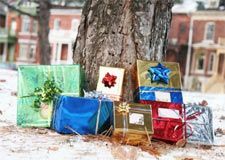 There is less money to go around, so people are approaching the holiday in terms of budgets, fixed spending, and limited gift-giving. If that seems like a bad thing, maybe it isn't. It actually might be a very good thing. Suppose your family does what many are doing for the first time in a while. You draw names, explain to children, and create a sense of appreciation for having family and one gift to anticipate – instead of being overwhelmed with so many things that nothing is really appreciated. Hmmm. It might be a good thing. Suppose you choose to forego gift-giving within your immediate family and, instead, adopt a person or family where a job has been lost. You forego buying for one another and spend your Christmas money on someone without any discretionary income. Hmmm. That might be a good thing too. Suppose your office should decide not to have its traditional Christmas party where gifts are brought to exchange. Maybe you have a small-scale party, put some money into an envelope, and give it to a shelter for homeless people nearby. Hmmm. That idea seems to have possibilities as well. Suppose your company takes the amount it traditionally spends on a party and turns it over to a church, mission, or ministry that works with children in your city. Hmmm. That wouldn't be a bad thing to be part of either. There is no need to keep listing ideas and options. You are creative enough to take the basic idea, set it down in your life, and come up with various ways to implement it. But why bother? One of the good things that comes of scarcity is appreciation. Someone who has gone without food or water for a while savors what would have been taken for granted. Let the electricity go out for half a day, and lights, heat, and other taken-for-granted things are appreciated. Less could be more for us! Maybe the distress created by the current economic downturn will have some positive effect along the way. We might learn that having less creates appreciation for what we do have. We could develop awareness of those who have even less. We might be more sensitivity to children, homeless people, or families in crisis because of a layoff or company closing. Perhaps prosperity is a greater enemy than want. Wealth has certainly ruined more people than adversity. If surplus tempts us to be soft and careless, times of challenge often seem to bring out the very best that is in us. It just might be that less could become more for us this year. "How Less Becomes More" by Rubel Shelly is licensed under a Creative Commons License. Heartlight encourages you to share this material with others in church bulletins, personal emails, and other non-commercial uses. Please see our Usage Guidelines for more information.